Colomiers is a village close to Toulouse. 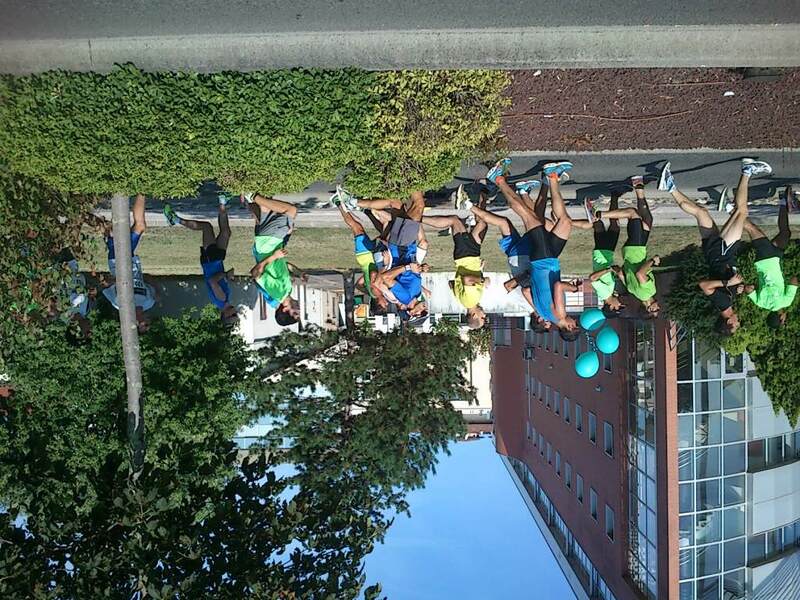 Today, I went there to take part in the race “Boulevards de Colomiers”, over 10km. Last year, I had already taken part in it, where I achieved my personal best over that distance with 46’14” (despite of the problems I had at the time with the Achilles tendon). Posing with Andre prior to the start. This year, I had in mind to follow the 45′-pacer as far as I could to break a new personal best. 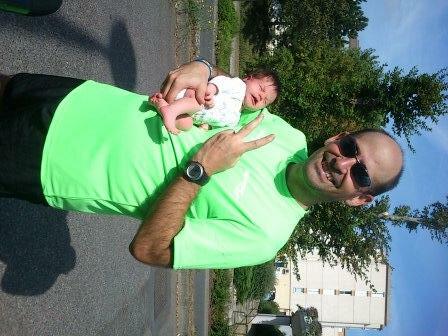 So from the start I followed the pacer, together with my co-worker Manuel. The weather was a bit hot and sunny, I would have preferred it colder and cloudy, thus I tried to take a bit of water in each of the water supply points, to ensure I was well hydrated. 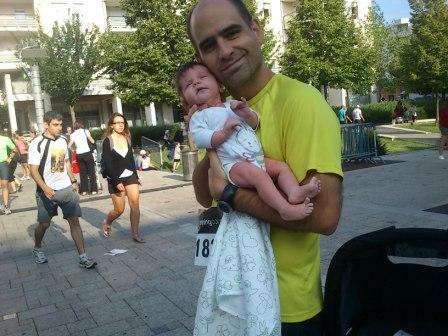 Boulevards de Colomiers 10k circuit. 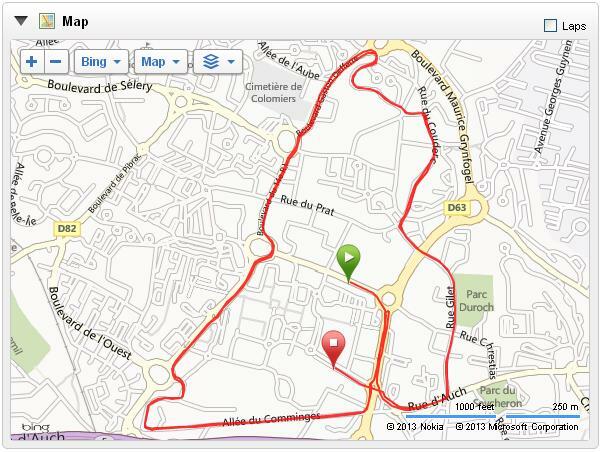 The race had 2 laps around a 5k circuit in the centre of the village. I tend to like this kind of races as then in the second half one can know what to expect (where the water stations are, sharp turns, small hills…). I was following more or less comfortably the pacer up until the 7th kilometre. Running at about 5k (see the pacer with the blue balloons, I am in the centre with the yellow t-shirt, picture taken by Luca). I found it not so easy to keep up the pace from the 8th to almost the end. I think it is mostly a psychological issue: the knowing that there is only 1 kilometre to go, that you are already going to beat the PB, etc., make the brain to send signals to the muscle in the way of “it’s ok, you can relax a bit, it’s done”. Then I saw the shop where we used to rent skies, knew that there were less than 400m to go and kept the effort up, at that point the pacer slowed to look and cheer up at the pack of runners that were following him (thanks!) and there we went for a last sprint. Posing with Andrea after having finished.